Astronomers are back in the dark about what dark matter might be, after new observations showed the mysterious substance may not be interacting with forces other than gravity after all. Dr Andrew Robertson of Durham University will today (Friday 6 April) present the new results at the European Week of Astronomy and Space Science in Liverpool. Three years ago, a Durham-led international team of researchers thought they had made a breakthrough in ultimately identifying what dark matter is. Hubble Space Telescope image of the four giant galaxies at the heart of cluster Abell 3827. An almost 3-hour exposure shows the view at wavelengths visible to the human eye, and the near infrared, as used in the original 2015 study. 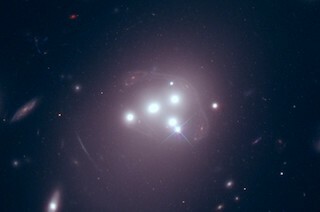 The distorted image of a more distant galaxy behind the cluster is faintly visible, wrapped around the four galaxies. Credit: NASA/ESA/Richard Massey (Durham University). Click for a full size imageThe chance orientation at which the Abell 3827 cluster is seen from Earth makes it possible to conduct highly sensitive measurements of its dark matter. However, the same group of astronomers now say that new data from more recent observations shows that dark matter in the Abell 3827 cluster has not separated from its galaxy after all. The measurement is consistent with dark matter feeling only the force of gravity. Lead author Dr Richard Massey, in the Centre for Extragalactic Astronomy, at Durham University, said: “The search for dark matter is frustrating, but that’s science. When data improves, the conclusions can change. 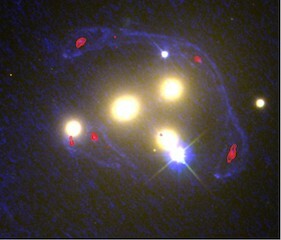 A view of the four central galaxies at the heart of cluster Abell 3827, at a broader range of wavelengths, including Hubble Space Telescope imaging in the ultraviolet (shown as blue), and Atacama Large Millimetre Array imaging at very long (sub-mm) wavelengths (shown as red contour lines). At these wavelengths, the foreground cluster becomes nearly transparent, enabling the background galaxy to be more clearly seen. It is now easier to identify how that background galaxy has been distorted. Credit: NASA/ESA/ESO/Richard Massey (Durham University). Click for a full size imageSeveral new theories of non-standard dark matter have been invented over the past two years and many have been simulated at Durham University using high-powered supercomputers. Robertson, who is a co-author of the work, and based at Durham University’s Institute for Computational Cosmology, added: "Different properties of dark matter do leave tell-tale signs. The research was funded by the Royal Society and the Science and Technology Facilities Council in the UK and NASA. The findings will appear in a new paper in the journal Monthly Notices of the Royal Astronomical Society. The Superpressure Balloon-borne Imaging Telescope (SuperBIT) has just been built by an international team of scientists and engineers from Durham University, Princeton University, the University of Toronto, and NASA’s Jet Propulsion Laboratory. The telescope achieves an uninterrupted view of the night sky by rising above 99 per cent of the Earth’s atmosphere under a helium balloon the size of a football stadium. This novel route into space costs a tiny fraction of a rocket launch and is far quicker to design. Following two successful test flights, SuperBIT is scheduled to fly for three months from New Zealand in 2019. From there, it will measure the distribution of dark matter around 200 galaxy clusters, something that would have been impossible using existing technology like the Hubble Space Telescope. Photo credit: SuperBIT/Richard Massey. The new research will appear in “Dark matter dynamics in Abell 3827: new data consistent with standard Cold Dark Matter”, R. Massey et al., Monthly Notices of the Royal Astronomical Society, in press. It follows up the 2015 research paper, “The behaviour of dark matter associated with four bright cluster galaxies in the 10 kpc core of Abell 3827”, R. Massey et al., Monthly Notices of the Royal Astronomical Society, Volume 449, Issue 4, 1 June 2015, Pages 3393–3406. - Ranked fourth in the UK in the Guardian University Guide 2018 and fifth in the 2018 Times and Sunday Times Good University Guide. - A member of the Russell Group of leading research-intensive UK universities. - Research at Durham shapes local, national and international agendas, and directly informs the teaching of our students. - Ranked the world top 40 globally for the employability of its students by blue-chip companies world-wide (QS World University Rankings 2017/18). - Highest rate of employment and further study in the UK for undergraduates completing their first degree (Higher Education Statistics Agency 2017/18).